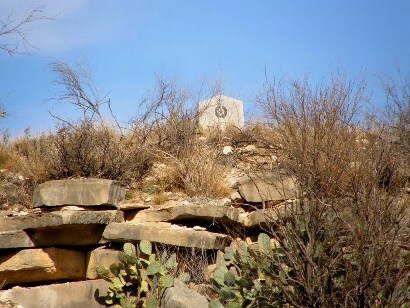 Pictograph Centennial Marker Concho County Texas. 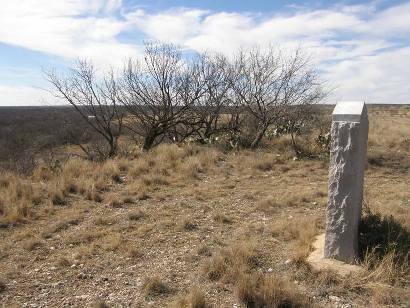 Words, and even pictures, cannot begin to tell what my visit to the site of the 1936 Texas Centennial Pictograph Marker was like. If only I had taken Gerald Massey's advice and purchased a digital voice recorder. That would have been a big help to me in telling the story of my meeting Kay and Fred Campbell. 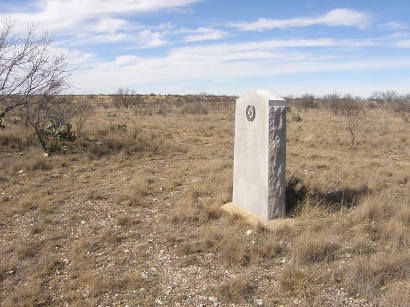 The Pictograph Marker is located near the Concho River on private property just north of Paint Rock, county seat of Concho County, Texas. I almost gave up seeing the marker after finding the gate locked at the entrance to the Campbell Ranch. Ruthie's notes gave no more information than where the ranch was located. I went back to Paint Rock and stopped at the Courthouse. I asked if anyone knew how I might contact someone to see the Marker and was given a copy of the Treasures of Concho County Brochure which had the phone number to Paint Rock Excursions, Indian Pictographs. I dialed the number. A delightful voice answered. 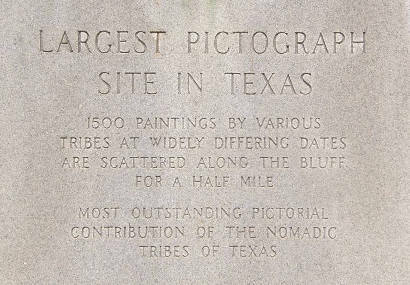 I asked if I could see the Pictograph Marker located on their property. She said I could but she would have to meet me at the gate. It would be a few minutes because she had just fixed a cup of hot chocolate. Thus began a visit I will long remember. At that point, I didn't know her first name and wouldn't have addressed her with it anyway, so I'll just call her Jewel in this little narrative because that is what she was with a special sparkle in her eyes. You can only imagine how her voice was like a rainbow. "She laughed and joked the whole time I was there." I mentioned the name of Ruthie Cade to her and that brought on a cheerful laugh. She began telling me stories about Ruthie's visits. Jewel said Ruthie is a Retired Army Colonel. She had some friends with her whom Jewel call 'Her Walkers' because they walked all over the ranch and, I believe, camped there, too. She mentioned Ruthie and �Her Walkers� many times during my visit. Jewel said she would have to ride with me in my pickup because her husband had their pickup and he got upset with her because she got so many flat tires on her little Ford Focus. 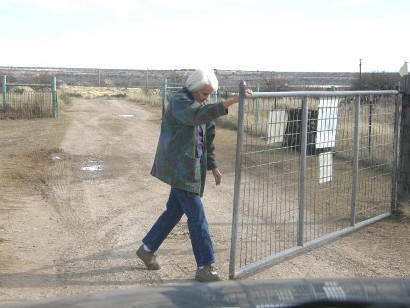 She had to get out and open all the gates because they had combinations locks. She asked me how many Centennial Markers I had seen and I told her I have not counted them. She chided me for not keeping better records. 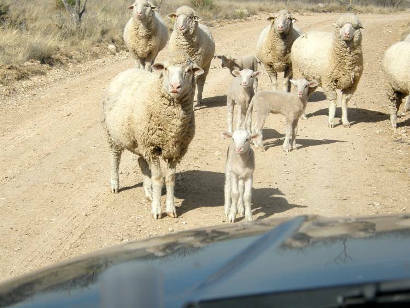 "She had to get out and open all the gates..."
Jewel began to tell me a series of stories about their sheep, goat, llama and donkey ranch, about her husband, Fred's world wide reputation as a sheep fiber expert, and that he had just received a special Sheep Council award in Nashville. She told me of her teaching days in Clayton, NM, before they married, of how her grandfather preserved the Indian Pictographs. 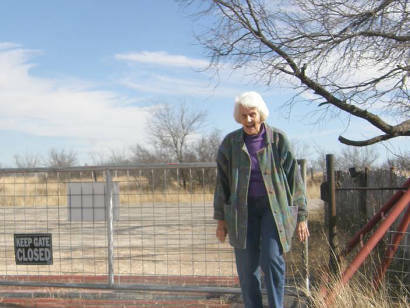 Her father died in 1932 right in the bottom of the Depression leaving her mother with anywhere from eight to twelve children, but who's counting when there are that many, and of the mortgage on this ranch of $110,000, roughly $1,400,000 in today's dollars. She told me that her mother worked extra jobs to raise her children and pay off the mortgage, how the government even back then was making life so hard for ranchers with new rules and regulations, that her uncle survived WWI only to die of Pneumonia on the troop ship coming back home so that Jewel's grandmother had to go to the train station to pick up the casket rather than meet her son returning from the Great War. 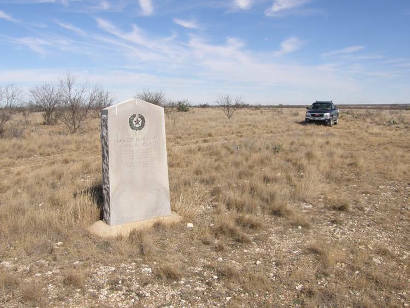 Jewel was a girl of nine years old in 1936 when Texas celebrated the centennial of its independence from Mexico partly by placing granite markers all over the state. 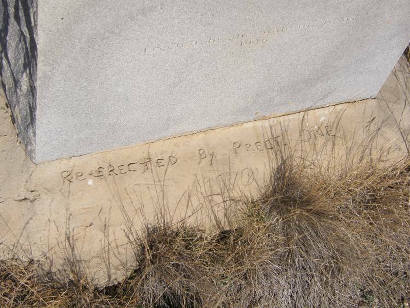 She is certainly one of the very few if not the only living person to have seen a Centennial Marker when it was placed and still lives on that very same property. One of the men who helped place it, James Ashford, was 18 years old at the time and has stayed in touch with the family all these years until just recently when he was diagnosed with Alzheimer's disease. She laughed and joked the whole time I was there. She was constantly telling me to slow down, don't hit that stump or it will give you a flat tire and turn here down that rutted trail. We pulled up to some goat and sheep pin. She showed me Blue Bell, her prized Angora Goat. I asked her if the marker was located here. She adamantly said, �No, it wasn't there because, you didn't turn when I told you to." We went back and I was supposed to have turned where there wasn't even a trail. No wonder I missed it. As we pulled up to the marker she kept telling me to slow down and don't run off that seventy foot cliff. 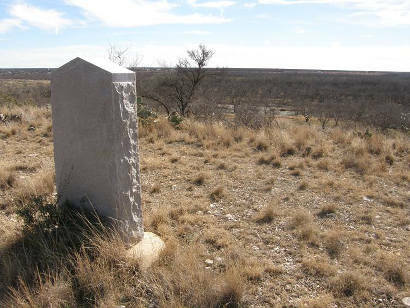 The Marker is, indeed, located very near the edge of a cliff. I took pictures of it, and I then carefully followed her directions back around to the base of the cliff. 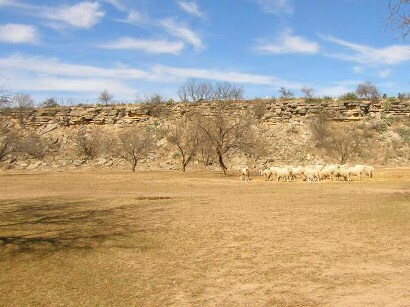 There is a perfectly level plain of probably ten acres right on the banks of the Concho River where maybe a hundred sheep had just given birth or were in the process. 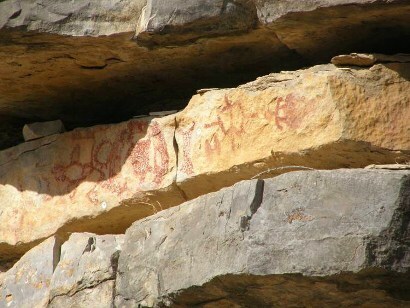 It was from the base that we could see the Indian Pictographs. 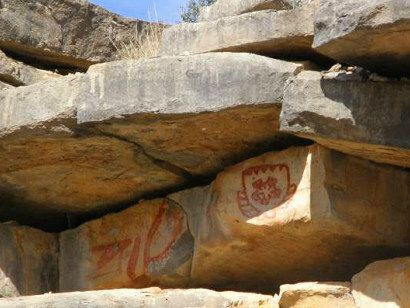 There are close to 1,500 paintings that are now protected from vandals and rock hunters. On our way back to the house, with Jewel closing the gates behind us, Fred drove up with a load of feed in the back of his pickup. He didn�t have much to say when she introduced me. His knowing smile let me know that he knew I knew the history of not only the marker but of the ranch, the animals, the pictographs, the Campbell family and a whole lot more. My visit to the ranch must have been at least a full hour, and when I left I knew I had met two very special people who are outstanding examples of what opportunities, through hardship, hard work and perseverance, are available in our great country. In perspective, my desire to see granite Centennial marker hardly enters into the equation at all. I didn't know how to start this little narrative and now certainly don't know how to end it except to say I am privileged and humbled to have been in the presence of two living granite markers whose significance far outweighs any mere slab of stone. I will remember the Campbells much longer than I will remember the reason for my visit in the first place. I hope this makes some sense to you as it is so difficult to re-tell something that impressed me so much.